This put matters squarely in Dad’s court. Mum was busy making some sort of banana-type atrocity, but Dad was just hanging out in his PJs. He could certainly make Jell-O! 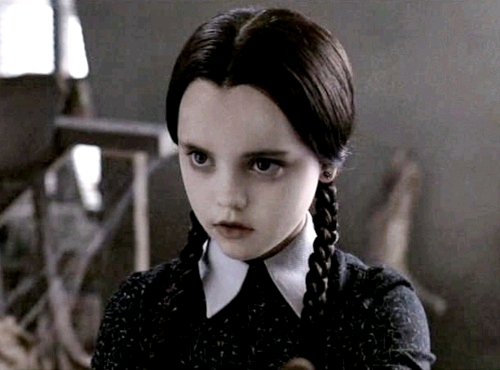 Now, if you’ve never met Miss V in person, just conjure up a picture of Wednesday Addams, only blonde. When that asks you to make Jell-O, you make Jell-O. Boil water, Dad! 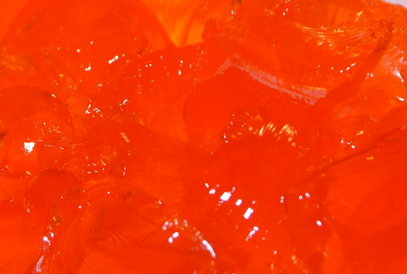 What makes gelatin so perfect for Halloween is its bizarre composition of random animal parts. If Miss V knew, I wonder if she’d eschew Jell-O? Nah. I recommend these delicious Halloween Jello Shots I found on Free-N-Fun Halloween. Prepare lemon Jell-O with 2 cups boiling water, 1 cup cold water and 1 cup vodka . Divide Jell-O into shot glasses and let chill in fridge for 4 hours. Prepare orange Jell-O with 2 cups boiling water, 1 cup cold water and 1 cup vodka . Divide Jell-O into shot glasses on top of the yellow layer and chill again for 4 hours. Top with whipped cream and candy corn when ready to serve. My dad, once he’d resigned himself to making Jell-O, said he’d make a different version—a version omitting everything but one package of orange Jell-O. Hell, he even omitted the shot-glass part. My favorite part of the recipe is “1 bottle rum”. You’re welcome to come over! That is brilliant. THE HAYBAG IS BRILLIANT. I trust you have lots of Advil. Does Dad break into his Bill Cosby voice when making jell-o? I know I always did. My Dad is lame! He did not do that. But for a while he was wearing silver-sparkled devil horns.